Just about every single yoga pose you enter into quietly relies upon this set of core muscles, yet the obliques receive scant attention compared to the larger core muscle groups along the anterior of the body. The transverse abdominals and pelvic floor understandably garner key attention within the yoga context, particularly where this discussion permeates classical points of interest pertaining to Uddiyana and Mula Bandha. However, every action movie has a star, and then a supporting crew that makes that star look extremely good. If the pelvic floor and transverse abdominals are the stars of yoga movement, the obliques are certainly a significant supporting crew that will seriously enhance how fluidly you move through your yoga postures. Internal Obliques: sits below the external obliques and works ipsilaterally with the opposite external obliques to achieve rotation and side-bending. As it is responsible for expiration in respiration process, it functions to compress the viscera back up towards the diaphragm thus reducing the thoracic cavity upon exhalation. Given its function, it becomes very obvious from a yoga standpoint the significance of the obliques in any kind of posture that originates from the core either from a flexion or extension dimension. In yoga movement we are constantly navigating between postures demanding flexion, back extension, twisting of the trunk and lateral stretching. The ability to move fluidly from one posture to the next hinges very much upon how quickly we can contract a set of muscles and then release them in order to accomodate a stretch. This is the dualistic role-playing from agonist to antagonistic function within a matter of seconds within the yoga vinyasa context. Within classical yoga concepts, the movement of Pranic and Apanic energies instigated by the contraction and release of key muscles in the body can be seen at the most basic level in your cat and cow stretching in table top position. At a more advanced level, this is vividly illustrated within the Ashtanga system in the transitional poses known as jumpbacks which lead to an upward dog where you are quintessentially moving from intense flexion to a backbend. This is why your Upward Dog will always feel a little unsatisfactory after say a pose like Paschimottonasana or Janu Sirsana followed by a jumpback. Similarly, dropbacks are known to be challenging for some within Primary Series sequencing given how activated hip flexors and transverse abdominus tend to be towards the end of the seated sequences where flexion features quite heavily in the majority of the poses. It’s no surprise that the Second Series is heavily into backbending whereas back extension poses are limited within the Primary Series. Without engagement of the agonists and smaller supporting muscles groups, moving from flexion to extension becomes laborious as the primary mover in flexion, namely the transverse abdominus cannot relax if the back extension agonists and supporting cast are asleep. If your front core is very active and your back muscles are weak, then your will find dropbacks a nightmare in Primary Series. The movement from multiple jumpthroughs and then chakrasana (backflip) demanding intense hip flexor and abdominal contraction to dropbacks is an example of this see sawing of movement from flexion to extension within seconds that can ask a lot of the transverse abdominals. The transverse abdominals are fully engaged in a jumpthrough but is also the key antagonistic muscle in a dropback. Whilst it provides stabilisation throughout back extension or dropback, the transverse abdominus must also relax and without appropriate signalling from the paraspinals and surrounds, the rectus abdominus will dominate and back extension will become challenging and present itself as lower back pain. When you cultivate a vinyasa style practice of constant flow and movement through postures that invite this interplay of pranic and apanic energies, and between flexion and extension, a greater awareness for all the muscle groups required for movement, both key and subtle can assist with greater transitional ease and fluidity. Moving in the opposite direction and with all that being said, the obliques play an important role in facilitating key movements requiring abdominal compression since its function relates to forced expiration. In other words, as the diaphragm creates more room within the abdominal cavity when it rises with the exhale breath, the obliques work in conjunction with the other core muscles to pull the chest compressing it down towards the viscera and inwards back into the spine. This has significant implications for postures requiring intense flexion and the “squeezing” of the contents of the abdominal cavity inwards such as in jumpthroughs and jumpbacks where the additional space you can create from the hollowing of the abdominal cavity accommodates deeper flexion and folding from the hip flexors. As they say, jumpthroughs and jumpbacks are a game of cms. Each extra cm or mm might be the extra spacing that helps you clear the floor. A half mm of clearance is as good as 3 inches. It does the job. Learning to engage the obliques can help intensify flexion of the torso through compression of the belly, thus creating more space between the hips and floor when arm-balancing. The engagement of the obliques also automatically suggest that the shoulders enter into protraction. 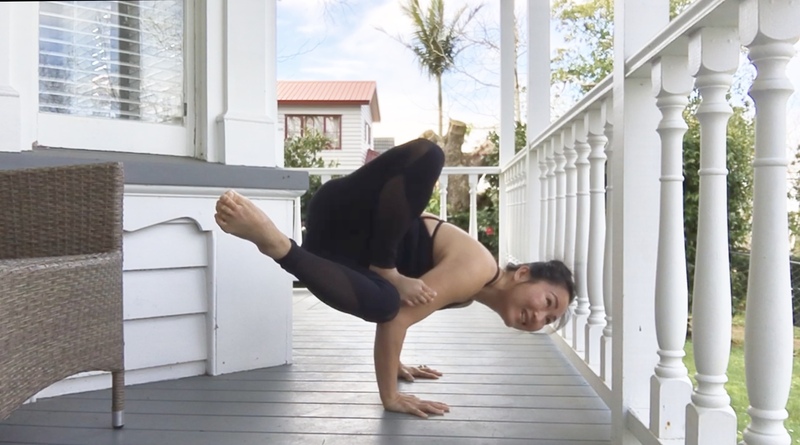 Shoulder protraction as we know help considerably in arm-balancing poses such as bakasana and lolasana and therefore consistent with oblique activation in your jumpthroughs and jumpbacks. When the shoulders protract, the triceps naturally want to engage and lengthen which again contributes to additional height in arm-balancing to clear the floor. Each muscular activity encourages another one and another one within a kinetic chain of action and the breakdown of the chain due to either muscular weakness of tightness can disrupt this chain of movement. Finally, the role that the obliques play in trunk rotation make them a fairly significant muscle to pay attention to in any kind of yoga posture demanding abdominal hollowing and then a twist such as from within the Sage Pose Series, both C & D ( Marychisana C & D ) and Twisted Side Angle Pose (Parivrtta Parsvakonasana). The additional room created from abdominal hollowing which demands a pair of active obliques helps accommodate a deeper twist, where the external obliques themselves act as prime movers. Conversations around the activation of key locks known as Uddiyana and Mula Bandha in yoga often revolve around the activation of the pelvic floor and transverse abdominals. However the obliques are extremely present in any exhale breath related to abdominal compression where the contents of the abdominal cavity are drawn down and inwards towards the back body and spine. A greater awareness for these muscles can help with your overall progress where major muscle groups are already active but could use the additional support for greater ease in and out of postures within vinyasa practice.